T2H2, Leo and Iory, booked into the Imperial Hotel in Prague this past November primarily because it was one of the few hotels listed on the internet with any kind of interesting interiors, most other places boasted white plaster boxes with arid “modernist” interiors that could just as easily been at a motel in East Oshkosh. Our room was spacious with large windows looking out onto streets lined with historic buildings; one of which boasted a tower/cupola of baroque fancy typical of central European Slavic countries. Our bathroom, entirely encased in two different marbles had heated floors, a real comfort, and one of the longest and deepest bath tubs that I have ever enjoyed. And yes, I did indulge in extravagant steaming bubble baths every night we were there, well worth the price of admission which in our case was just under $1000.00 for seven nights. The Café Imperial at the Imperial Hotel in Prague has an eclectic décor. It is now described as the Hotel Art Deco although it was built in 1914 a decade or more before that term was invented or that style deployed. “Art Deco” derives from the famous, Exposition Internationale des Arts Décoratifs et Industriels Modernes held in Paris in 1925. I believe calling the Imperial, Art Deco is an attempt by the current owners to distinguish it from the Hotel Pařiž, Art Nouveau, another historic hostelry in the neighborhood. But also it is a stab at defining the décor of the Imperial and especially of the famous Café Imperial. Most of the existing historic interiors of the first floor of the Hotel employ glazed ceramic “tile” decoration with high relief sculptural technique. These ceramic interior decorations were designed in 1913 by Prof. Jan Beneš, sculpted by Josef Drahoňnsky and manufactured by The Royal Lichtenstein factory for Ceramic Goods in Rakovnik. That company is now known as RAKO. It is still in operation and they were instrumental in the restoration of the Imperial Hotel (2007). Here, in the outer lobby, we see the lintel over the door depicting a classic Egyptian device of outspread vulture wings centering a sun disk engraved with the initials J K. The disk is encircled by cobra heads. On either side of the café door two sturdy female figures in Grecian costume guard the entrance. Flanking the doors are two columns of figurative tiles representing a procession of figures that have alternative Grecian and Egyptian costume. 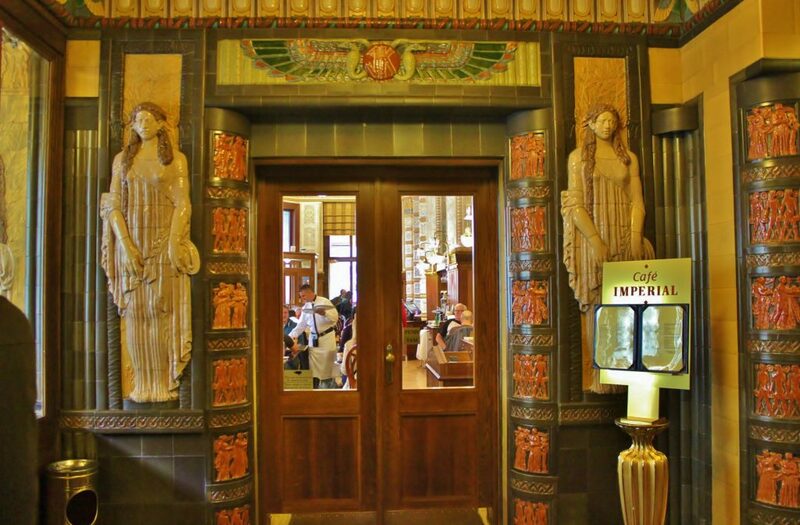 All of this is only a prelude to the wealth of imagery drawn from numerous historical times and styles that completely sheath the walls and floors of the Café Imperial. 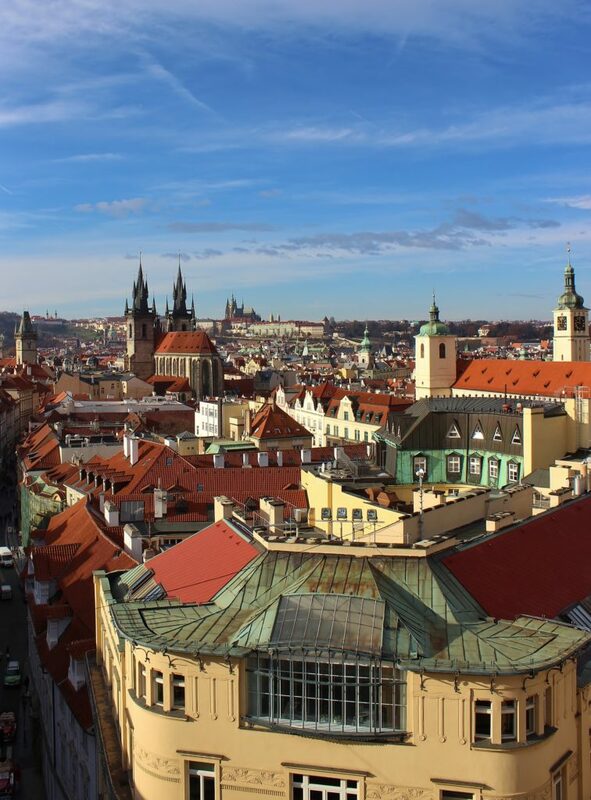 In the center of the Prague Castle stands St. Vitus’s Cathedral. 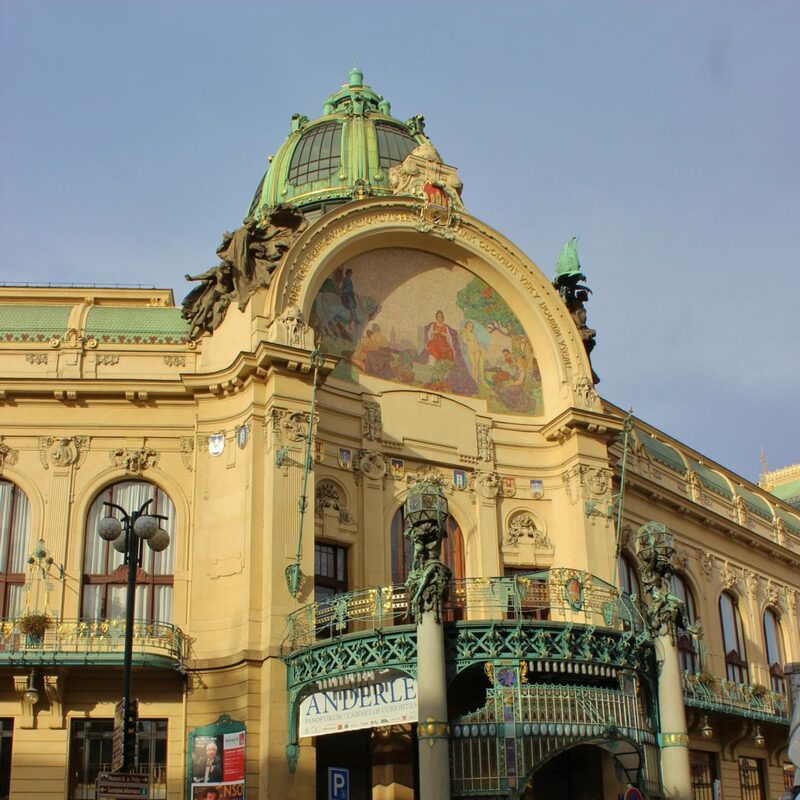 It can be seen from all over the city, crowning the Hradcany or castle hill district, . Although the cathedral is dedicated to three Saints, Vitus, Wenceslaus and Adalbert it is generally referred to simply as St. Vitus Cathedral. It was under construction for nearly 600 years beginning in 1344. The west front, employing a Gothic revival style, was only completed in 1929 and the beautiful Gothic details are in complete harmony with the original east end designs by Matthew of Arras and Peter Parler who were the fourteenth royal stone masons and designers of the Cathedral. 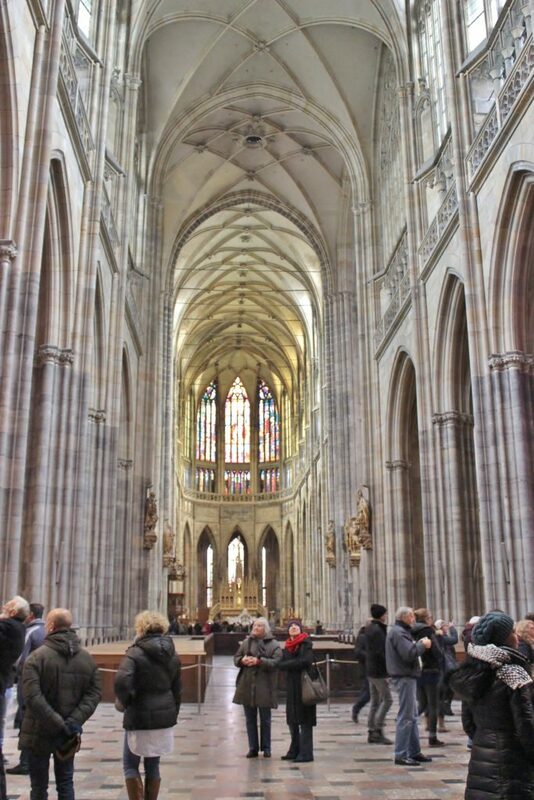 Here is the interior of St. Vitus Cathedral. The formal entrance of the west front leads directly into this spectacular nave with its elegantly extenuated proportions reaching to heaven and intending to represent God’s heaven on earth. 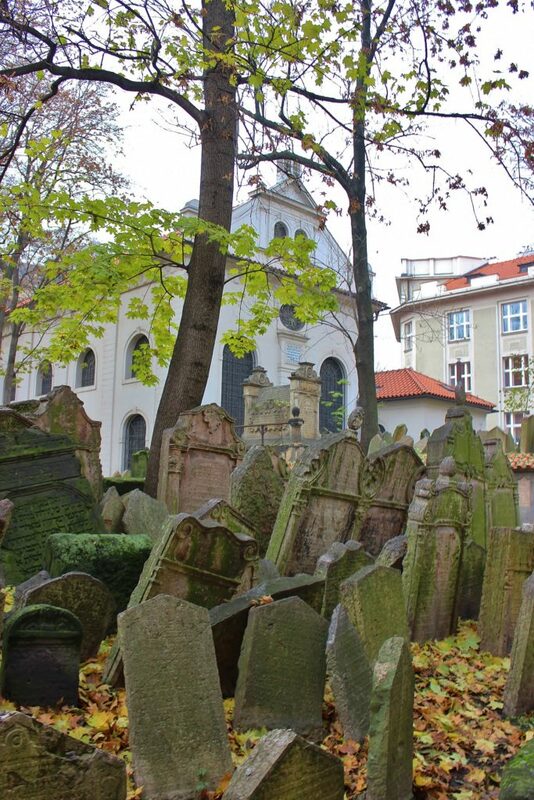 In stark contrast to the magnificence of St. Vitus Cathedral, the Jewish cemetery is jammed into what remains of the Jewish ghetto neighborhood in Prague. These stone monuments memorializing individuals who survived centuries of catholic oppression, topped off by the Nazi holocaust, have assumed a variety of oblique postures indicative of the writhing agony of a wrongfully oppressed people. Let us be forever vigilant against religious intolerance that can and does infect all peoples in all times. I believe the concept of separation of church and state is a prime tool to avoid scapegoating one branch or another of our human family. It is important to discern the difference between self-righteous religious moral taboos and objective civic rule of law. 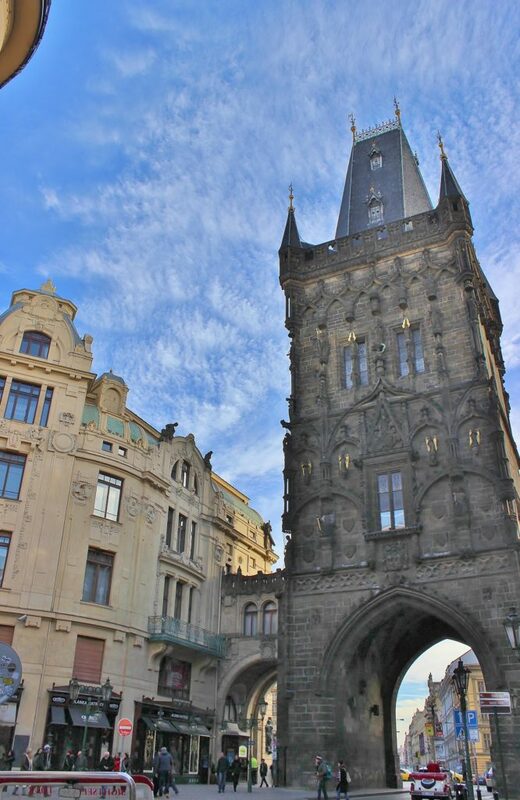 The various picturesque towers of Prague are justly famous remnants of their local history. I love towers and would very much like to live in one someday, so I was thrilled to discover that The Powder Tower was open for visiting. The morning I was there the only other folks around, apart from a helpful and informative guide on the second floor, were two gay men (my presumption from acute personal “Gaydar.”) So I more or less had the place to myself and I could drink in the atmosphere of centuries. At Street level one enters an ancient iron reinforced door and climbs up 186 irregular steep spiral stairs to an outdoor lookout protected by sturdy battlements from where you can see the entire city. Within the tower, below this viewing gallery, are two stone chambers one above the other. They are fitted with stained glass windows incorporating the royal insignia of the territories of the Kings of Bohemia. The rooms are finished with Gothic vaulting and decorated with interesting bracket sculptures. The Powder Gate was built in 1475 to celebrate the new reign of Vlaislav II. It was designed by the royal stone mason Peter Parler. Powder Gate was one of 13 entrances of the Prague defensive wall leading into the Old Town and was built as a ceremonial decoration rather than a defensive bastion. In fact this structure was a coronation gift from the City Council intended to add prestige to the Royal Court then under construction next door at the present site of the Municipal House seen in my photo above. Due to political unrest in 1483 Wladyslaw II had to abandon The Royal Court for Hradcany, or old castle on the hill. In the 17th century Powder Tower was used to store gunpowder and was badly damaged in 1757 during a Prussian occupation. 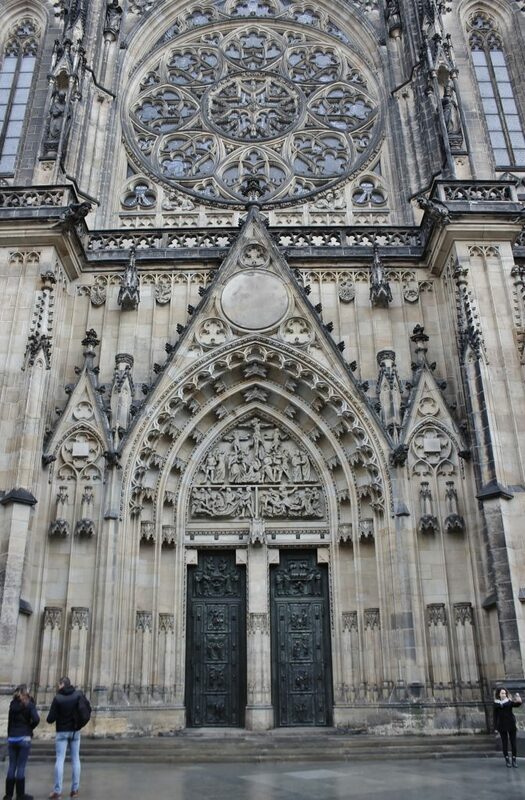 It was finally rebuilt between 1875 and 1886 by Josef Mocker an important Gothic revivalist architect who also worked on completing St. Vitus Cathedral. During our visit, mid-November, the weather in Prague was mostly overcast and foggy or drizzling, no down pours, thank you Goddess, but not so great for outdoors photos. The day I climbed the Powder Tower was the exception and a just reward was reaped when I looked out onto the fairy-tale city of Prague. In the center bottom of this photo I was fascinated by the top floor apartment with its extensive skylight windows which look out onto the highly decorated Gothic Power Tower. Was this a studio of one of the great Prague painters? In the middle distance can be seen the distinctive steeples of the Church of Our Lady before Týn and on the horizon are the towers and pinnacles of St. Vitus on Hradcany, or old castle hill. 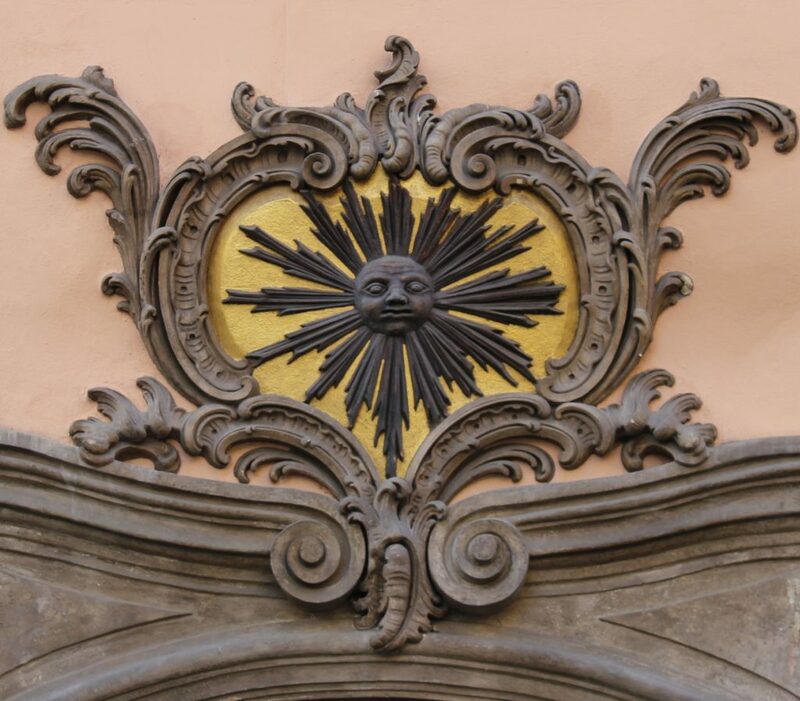 Now here is an architectural decoration that is indicative of middle European Rococo design at its best. The sun, with cheeks fairly bursting with energy is counter-intuitively painted in deep black whilst surrounded by a radiant golden sky which in turn is surrounded by fanciful rocaille shapes of decorative abstraction hinting at waves, leaves, feathers and scrolling swirls all conjuring a frenetic exuberant joy. 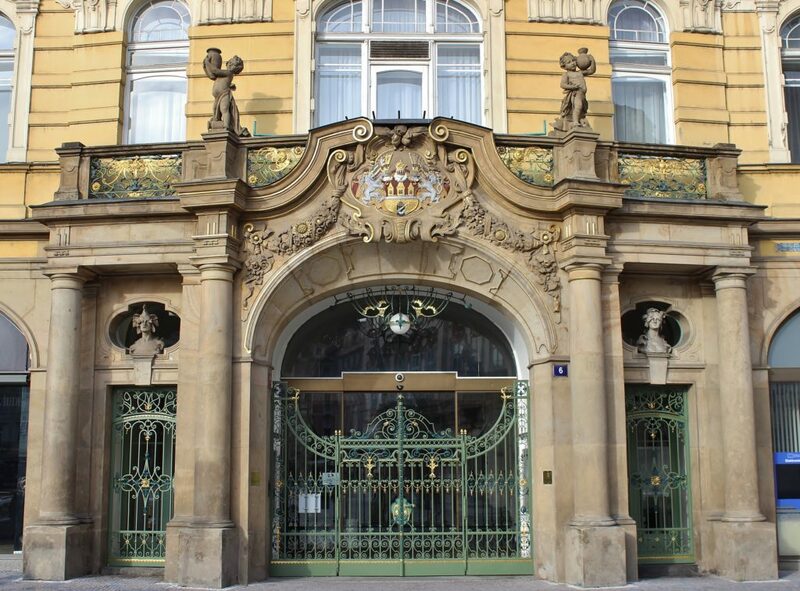 The entrance of the Prague City Insurance company is a fanfare of grandeur that incorporates all kinds of sculptural embellishments. The building is now the State Ministry of Regional Development. Inside the Church of Szent Mikulas or St. Nicholas in the Old Town Square of Prague. The image of Saint of Nicholas is beautifully represented in stained glass holding the traditional Christmas gifts of fruits. And yes kids, if you don’t behave you only get a wooden spoon or broom straw both used to discipline naughty children. The surrounding crystal chandelier is unique and appealing. 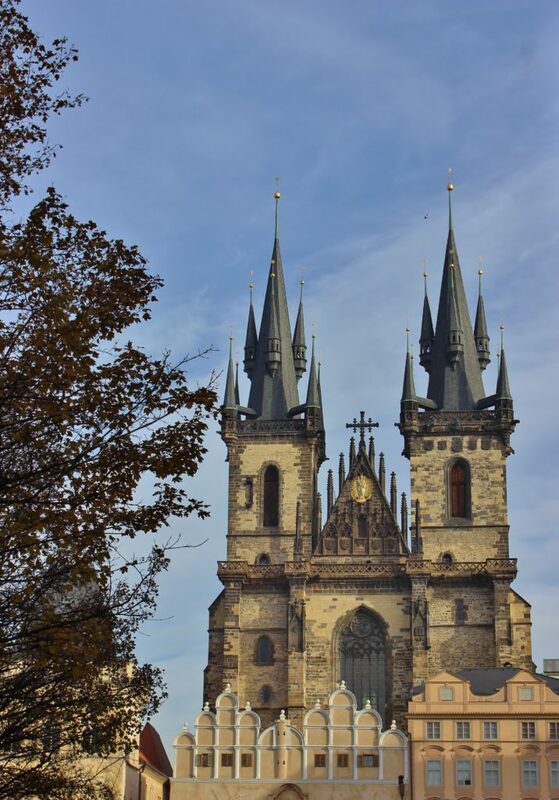 The twin towers of the Church of Our Lady before Týn are a landmark of the city of Prague. The church was begun in 1365 and became the church of the Hussites or “Chalice People” who were a Christian movement in the Kingdom of Bohemia following the teachings of Czech reformer Jan Hus (c. 1369–1415.) Hus became the best-known representative of the Bohemian Reformation and one of the forerunners of the Protestant Reformation. Tyn translates as enclosure, referring to the courtyard behind the church that was used as a safe stopping place for foreign merchants. From the 12th century foreign merchants came with their precious goods, after paying a fee (called ungeld) they were under the protection of the king. Stock rooms, stables, comfortable accommodation facilities and also a hospital were provided there for the merchants. At the bottom of my picture, between the west front of the Týn Church and the Old Town Square stands the Týn School or Collegium Sanctissimae Mariaehe. Týn School was one of the oldest Latin parish schools in the country (founded in the 13th century). The main goal of the school was to educate and raise children of Prague merchants and to prepare students for entering the Charles University. 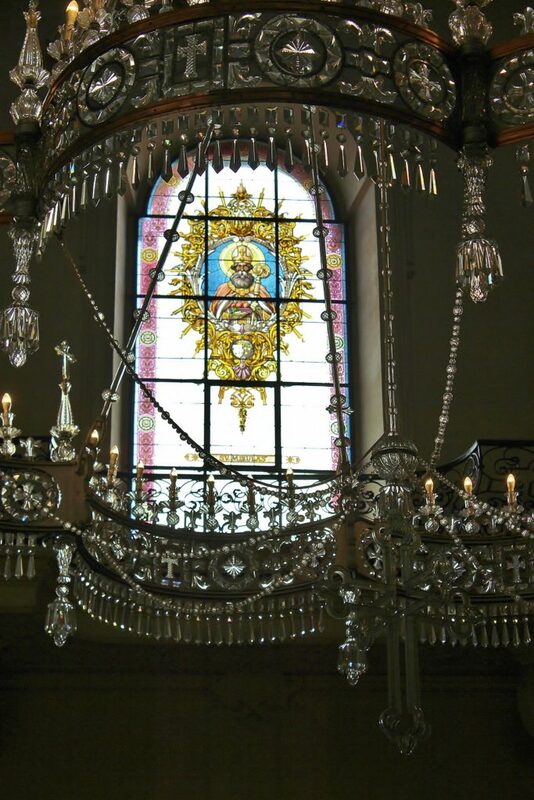 The Hussites used the church until 1623 when it was taken over by the Jesuits as a result of the counter-reformation. From the end of the 14th century until mid-19th century the building was used as a school, afterwards it was converted into flats. I must admit I am a sucker for exquisitely detailed nineteenth century monuments, especially neo-Gothic ones and here is an impressive example. Before you, sits the stern image of Law pointing to the established word of law as recorded in the large open book on her lap. 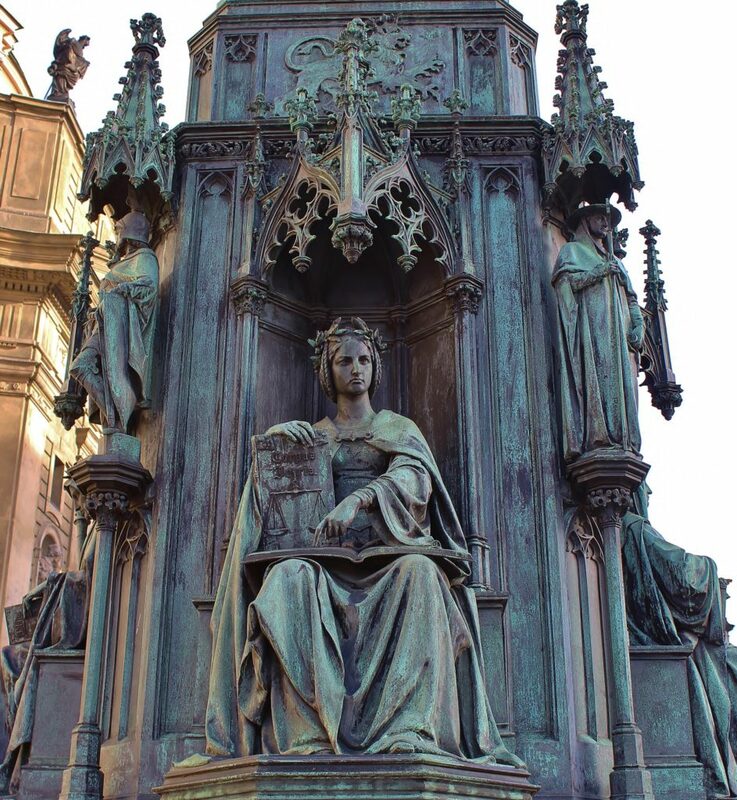 In her right hand rests another Book with the title “Corpus Juris” which as you know translates to “body of Law.” Beneath this title are the scales of judgement symbolizing justice. The monument actually celebrates Charles IV and his handsome statue stands above and is supported by this highly decorated pedestal. Charles IV, often called Pater patriae (father of the country), was an important monarch of medieval Europe. He made Prague the capital of the Holy Roman Empire and he founded the oldest university in Central Europe – the Charles University – in 1348. His monument was made on the occasion of the 500th anniversary of the Charles University in 1848. This entry was posted in Prague 2016, World Travel on January 27, 2017 by ioryallison3.